Carnival Paradise inaugurated Carnival Cruise Line’s first-ever voyages to Havana, Cuba, in late June – the first of 12 voyages that feature the historic Cuban capital. In addition to the opportunity to experience and explore this fascinating and previously off-limits destination, guests sailing aboard these four- and five-day voyages are enjoying a wide variety of Cuban-themed activities and entertainment, highlighted by Amor Cubano: A Caribbean Dance Romance, a dazzling high-energy show that showcases both classic and contemporary Latin hits. Part of the line’s popular Playlist Productions shows, Amor Cubano: A Caribbean Dance Romance features a sizzling four-piece Cuban band and a talented eight-member cast who have audiences singing and dancing in the aisles as they perform songs by top Latin artists, including Gloria Estefan, Celia Cruz and Pitbull, amid a tropics-inspired backdrop of Cuba and Miami. The show leads into the Havana Nights Deck Party, a Cuban-themed soiree where Amor Cubano cast members are joined by a DJ to keep guests dancing on Lido Deck into the wee hours. 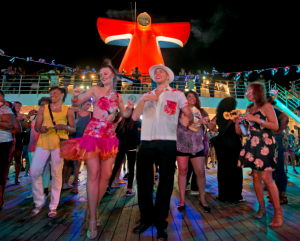 During Carnival Paradise’s cruises to Havana, guests can also participate in Cuban-themed games and hone their dance moves with salsa lessons led by the Playlist Productions team. There’s also a lecturer on board who discusses the country’s rich history and culture. Carnival Paradise will operate 10 four- and five-day cruises to Cuba between now and May 2018. Upcoming four-day cruises depart Aug. 14, Sept. 7 and 21, and Oct. 5 and 19, 2017, as well as May 3, 2018, and include a daytime and overnight visit to Havana. Five-day voyages depart Aug. 14 and 28, Sept. 25 and Oct. 9, 2017, and include a daytime and overnight visit to Havana as well as a stop in either Cozumel or Key West.